Place the yogurt in a large bowl and gradually whisk in the oil. Whisk in the vinegar and enough of the cold water to make a somewhat thick mixture. Stir in half of the cucumbers, scallions, salt, and pepper. Puree in a blender or food processor. Transfer back into the bowl and stir in the remaining cucumbers. Refrigerate until well-chilled, at least 1 hour. 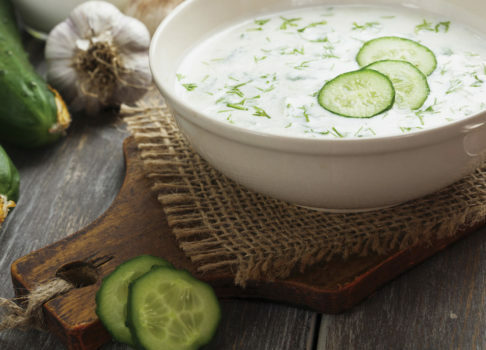 Serve the chilled soup sprinkled with the walnuts (if using) and the dill.